So...the surgeon says my dad is not a good candidate for surgery at this time. Several weeks from now, a month from now, maybe. His blood is not clotting correctly and they need to work on getting that fixed. For now, they have taken him off all the monitors, he is moving freely and very comfortable. We are thinking (this is not from the doctors) that maybe he'll get to go home next week. For now, he has a constant stream of visitors, children, grandchildren, siblings and some friends. He knows he is loved and has lots of people that want him to keep fighting. What happens now is in God's hands alone. My dad's surgery was cancelled at 7:15 a.m. The surgeon said he was reviewing my dad's tests and history last night and determined that his blood clotting ability was not where it needed to be to undergo a bypass procedure. I'm not sure whether to cheer or be sad. The prospect of surgery of this magnitude with him in the fragile condition that he is in, had me quite anxious about how it would come out. Also the long road to recovery afterwards was a bit daunting. But, without the surgery...how long can he live? But I must remind myself, that everything is in HIS hands and we must find comfort in that knowledge. And we must trust in the training and expertise of the physicians. So what is the next step? I have no clue. How long will they keep in the hospital? Unknown. Will they decide to do the surgery a week from now? Could be, not sure. The praying continues. For improved health. For a stronger heart. To go home and have a good quality of life. In the midst of all this I am SOOOO thankful that Jim is doing well! Keep praying!!! And we will continue to pray for you too. I'm so sorry for not posting sooner. I'm getting feedback that my lack of updating caused concern as to whether there was a problem. Well, the problem is definitely not with Jim. He is doing wonderfully! If he wasn't sporting a bald head with some patchy dark hair in the back, you would think there is no way that this guy could have anything wrong with him. He is moving around so well now! He has almost no limp anymore. He has started doing his stretching exercises this week and remarked just this morning that none of them cause any pain! He can tell that he hasn't used his leg muscles correctly in quite awhile. Any discomfort he is feeling is good discomfort, due to working those muscles. Monday 2/1 will be chemo #3. We know that the remaining chemos will each beat him down to some degree, but we are optimistic that the Lord will hear all our prayers and let those side effects continue to be minimal. Thank you for your continued prayers in that regard! So Jim is doing well, but my dad (Larry) is not. On Monday they did an angiogram and found multiple areas of blockage in his heart. They have determined that they need to do a triple bypass (possibly quadruple) tomorrow (1/29). My dad is very fragile. He has suffered at the hands of his diabetes which he has had for 40 years. His organs have taken a beating over the years with the intense high and lows that he has endured. (He is a "brittle" diabetic.) The doctors have said his kidneys are in the best shape they've been in for awhile...which is amazing considering he was heading towards renal failure a couple months ago. So it looks like all systems are "go" for the surgery. Many of you do not know my dad, but he is a gentle, loving man. So if you would be so kind as to raise a prayer on his behalf I would be most appreciative. Not much to report this week (alleluia!). Jim has been sleeping well, has worked every day, is not overly tired, is eating well and feels pretty good. What a blessing it has been! The Lord has heard all of our prayers. Don't let up though as Jim still has a long way to go! Thought I'd share some pictures with you. 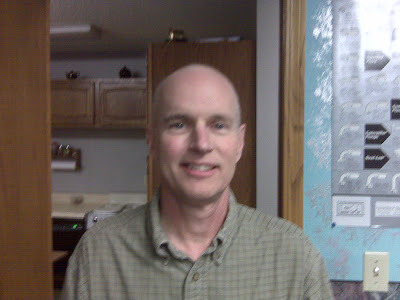 One of our co-workers, Tim, decided to buzz his hair in support of Jim's recent hair changes. He decided to give Jim the honors of doing it himself. So on Monday evening, after we closed shop, Jim played barber and buzzed Tim's hair. Tim's wife even brought their 2 kids down and they got to watch their daddy do a very nice thing. Can you tell Jim was trying to do a good job? Here are the two baldies together! Jim & Tim...lookin' good! If you have any more room on your prayer list, add my Dad (Larry). He was admitted to the hospital this morning. We took him to the ER after he experienced shortness of breath. Seems he had a heart attack sometime in the last 48 hours and didn't know it. Now they need to do some heart tests to determine the damage but due to kidney issues (diabetes related), they have to be very careful or they could throw him into renal failure. Keep on praying. We in turn our praying for all of you, our prayer warriors. You don't know how much we appreciate it! This is the "new" Jim! Looks pretty good doesn't he? The concensus is that he is a pretty good-looking bald guy! Everyday last week he was losing big bunches of hair and he was looking a bit "odd". Plus he was tired of cleaning up his pillow each day and cleaning out the shower. The loss had become pretty dramatic. So on Friday he said he was ready to "buzz it". We didn't shave it. We used a razor with a #1 guard on it. I've never used one before but Jim assured me there was nothing to mess up! Enough with hair. I'm sure you want to know how he is doing 6 days post-chemo #2. The answer is...just fine. He has a couple things going on, none of which are serious. The first thing is difficulty getting a good night's rest. He noticed this after chemo #1 also, so this may be something he needs to expect during that first week after chemo. We think it is because of all the fluids that were put into him during the treatment. We think that they are just working their way out of his body. So...that means getting up several times each night to use the bathroom. We also think the Predisone that he takes for 5 days after each treatment has him "rev'd" up to the point that he doesn't get into a deep sleep. Predisone is a steriod. It tastes awful and Jim is always glad when the fifth day comes and goes and he can quit taking it. One of the other things that he is noticing is heart burn. Not terrible. But enough that it woke him up last night and he took some Tums. Which did help. He is feeling some of the heartburn again tonight. This didn't happen last time, but we have a friend that went thru chemo a few years back and she said that she had lots of heartburn issues. Hopefully that won't be the case for Jim. He has been feeling a little tired and took naps both yesterday and today. But overall he is feeling pretty good. The reduction in pain in his hip has given him more mobility. He took care of his mom's trash and recycling this week which is major. He hated having me do "his" job over the last several weeks, but he just wasn't physically up to it till now. I'm not discounting the possibility that as the chemo treatments continue that I may have to take care of those tasks again. I'm willing...he just better not get used to it! I'm probably telling you more then you want to know, but my posting has become my journal so to speak. By stating specifics we are able to go back and accurately compare the details from one treatment to the next. I want to leave you with this thought (author unknown): GOD didn't promise days without pain, laughter without sorrow, sun without rain, but he did promise strength for the day, comfort for the tears, and light for the way. Please continue praying for minimal side effects from the chemo! Thanks so much!!! It is hard to believe that Jim can be four weeks into this chemo thing and how good he feels. The hip pain (where the biggest tumor was) has subsided so much that he has quit using the cane and now moves with a fairly normal gait. When we are walking side by side I'm walking at my normal pace. His stomach has been a bit "wiffy" (a word my deceased mother used to use whenever her stomach felt a little off). That was the word Jim used when I asked him how he felt last night. He knows it brings a smile to my lips when I hear it - because it makes me think of her. Anyways, he took one of the anti-nausea pills and in pretty short order he felt better. He has had multiple people hammer into him that he should not wait to take it. At the first sign of discomfort he needs to take it. He did - and it worked! Jim is losing his hair in a big way. Every day this week he pulls another big gob of hair out of the shower drain. He is also using a lint roller on his pillow each morning to "clean it up"! It appears that the dark hair is going first as he only has gray left on the top and sides. He still has dark hair in the back but it is starting to get pretty blotchy. He is rapidly approaching the point in which he is going to have it buzzed off. I asked him this a.m. if it was weird looking in the mirror. He said, "Yes, just a little bit". I'm pretty sure I would not even go out in public without having my head covered at this point. But I think that I'm alot more vain then Jim is. I think also that women in general would deal with the whole hair loss thing much harder then men. If you'd like to see a current picture of him (taken yesterday) you can go to Becca's blog where she has posted two shots. We've heard quite a few hair loss stories lately that have been pretty interesting. One person told us about a gal who had cancer twice, had chemo twice, lost her hair twice, and each time it came back a little different. We also were told about a guy who had no hair on the top of his head before receiving chemo and when it came back in later he had hair on the top again. How weird is that? So now we play the wait and see game. How will it affect Jim...hmmm....??? So for now, all is well. Jim is feeling pretty good. I can't say he is looking pretty good..but that is from a cosmetic perspective. He is smiling because he is so glad about the decreased pain in his hip/leg. He is working and not feeling overly tired at the end of the day. Bottom line - we have alot to be thankful for. We are blessed in SO MANY WAYS! We also know we are blessed to have family and friends who care enough to pray for him and his recovery. Thank you so much for that! Once again, I will share Jim's work email address so if you want to send him any wishes you can do so. It is jim@customhose.com . Chemo # 2 was today and it went very well. We were at the oncology office at 8:15 this a.m. Jim had lab work done and then met with the doctor. Dr. Nabi had lots of questions about how Jim did after the last chemo and was very pleased to hear that he had very little side effects. Dr. Nabi said that Jim has a guage that most chemo patients don't have. She said most chemo patients have to have blind faith that the chemo is doing its job, whereas Jim has physical proof ---- the reduction in pain in his hip. Jim said his hip feels 85-90% normal. The cane may be a thing of the past very soon! YEAH! Jim feels really good tonight and is planning on being at work tomorrow. The doctor prepared him for the fact that the side effects could be a little harder with each treatment. So please continue the prayers for them to be minimal! The plan that the doctor has laid out is to have chemo #3 on 2/1 and then just before chemo #4 she will schedule scans to see how everything is progressing. Based on how good Jim's hip is feeling it is a pretty sure thing that the tumor is shrinking. YEAH!! Thanks to all of you who are praying for Jim! We know they are making all the difference! The supportive emails and cards are also greatly appreciated. I've made this vegetable dish many times since I found it in 2008. Absolutely delicious! Everything can be prepared the day before and the actual roasting on the day you wish to serve it. You also have alot of flexibility on the vegetables used! In a large bowl, combine the vegetables. In a small bowl, whisk the oil, lemon juice, garlic, rosemary, salt and pepper until blended. Drizzle over vegetables and toss to coat. Transfer to two greased 15-in x 10-in x 1-in baking pans. Bake uncovered at 400 degrees for 20-25 minutes or until tender, stirring occasionally. It not only tastes great, but looks really good! Jim is dealing with a cold these days. His sore throat is just about gone but the sinuses are still running. The doctor's office told him he can use over the counter cold medicine which he is and it is helping some. His sleep isn't being affected which is a good thing! Two specific things that Jim has noticed regarding his hip pain. First, he hated sneezing because of the pain that it caused in his hip. With this cold there has been some regular sneezing and it doesn't hurt anymore. The other thing is stretching. He couldn't really do a full body stretch before without pain and now he can. We interpret that to mean that the tumor in his hip is shrinking. Which means the cancer is getting smaller....YEAH! On the hair issue...it is only a matter of time before it is gone. This morning when he got out of the shower he had hair strands all over his face. Then we checked his pillow and sure enough there was hair all over it. If you looked at him right now you wouldn't notice anything...maybe a little thinner all over. You know how you run your hand through your hair after a new haircut and you have hair all over? That is what is happening. Nothing major, just constant. Plus, he didn't shave this morning. It wasn't worth the effort for the minor growth. We both consider this a minor side affect. He'll gladly take hair loss over nausea any day! Chemo #2 is rapily approaching! Just a few more days. This one should not take as long as the first one. They really watch the patient closely during the administration of the first one, checking for reactions. Plus they administer it slowly. The process should be a little shorter this next time. Maybe 5 hours instead of 6. The first round was a good experience (as good as chemo can be). Everyone was so nice and Jim enjoyed visiting with the other patients that were sitting near him. He says the time went by very quickly. Jim is having continued improvement on his hip/leg pain. I've seen him move around more without the cane which is a very good sign. On the flip side, he seems to be coming down with a cold. He started gargling with salt water a couple days ago when he felt the early tickle of a sore throat. Today you can hear it in his voice. Hopefully he can get past it before the chemo in 6 days. Hair today... gone tomorrow??? He has noticed something else that is a bit odd, his facial hair seems to not be growing as fast. He commented this morning that he could probably get by without shaving as it wasn't much more then a 5:00 shadow. (Although he went ahead and shaved anyway.) Whether this is an indication of changes to come we don't know. 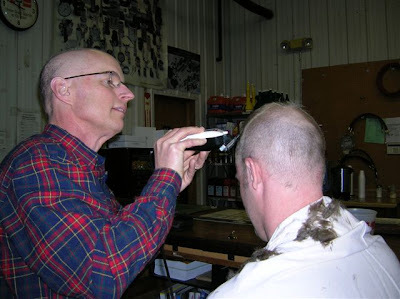 Jim has stated repeatedly that losing his hair would be no big deal. Of all the possible side effects this one is the least concerning. Rachelle and Becca went shopping for an assortment of head gear for him a couple weeks ago. With the very cold temperatures we are experiencing he now has a variety of hats that he can wear indoors or outdoors. So if it happens he is ready. Things are going so well for Jim! Aside from being a little tired he is feeling pretty good. Naps have been pretty common during the days we've been off of work. The pain in his hip (where the biggest area of cancer is located) has been getting better, a little bit more every day. Dr. Nabi had said that he could start feeling relief after the first chemo treatment and she was right! Jim has been sleeping well, getting up only once each night over the last several days. We are so grateful to all of you who've called, emailed, and/or prayed for Jim. He has a wonderful positive attitude and your "well-wishes" have alot to do with that. The chemo treatment #2 is in 8 days (1/11/10). It is cookie making time! This was a different Christmas season. With Jim's cancer diagnosis in early December, I did absolutely NO BAKING! That is totally out of character for me as I usually have cookies, candy and other treats coming out of the kitchen almost every evening leading up to Christmas. If it were not for the generous baking gifts of friends and family we would not have had any Christmas goodies to eat this year. Needless to say they are all gone now and I needed to stock up on some treats. I have a couple favorite cookie recipes that I made between yesterday afternoon and today. I made double batches of each cookie, leaving a few out but putting most away in the freezer for consumption at a later time. The first cookie recipe I'm going to share is one that I've been making for many years. It is the only chocolate chip cookie that I make for the family now. Mix sugars, butter, vanilla and egg in a large bowl. Stir in flour, oatmeal, wheat germ, baking soda and salt. Add in chocolate chips and nuts if desired. Bake 8 to 10 minutes or until light brown (centers will be soft). Cool slightly; remove from pan and put on wire rack. This is the mixed up cookie dough. I use Ghiradelli dark chocolate chips for most of my chocolate baking needs. The cookie scoop makes nice rounded balls of dough. Make sure you smash the dough balls. I use a sandwich bag that I put my hand into. I get three dozen delicious cookies out of this recipe. I found the following recipe in October of 2009 and have made in several times since. As indicated by the many pumpkin recipes that I routinely make ----I love pumpkin! Mix pumpkin, brown sugar, eggs and oil thoroughly. Blend dry ingredients and add to pumpkin mixture. Add raisins and nuts, if desired. Drop by teaspoonfuls onto a greased cookie sheet. Bake 10-12 minutes until golden brown. This is the mixed up dough. Here is the fnished product! These cookies are not real sweet but the pumpkin and cranberries compliment each other very nicely. I frequently freeze cookies. Sometimes I put them into Tupperware containers with waxed paper between the layers. Other times I package them in sandwich bags (3-4 per bag) and then put the sandwich bags into a freezer bag. They keep very nicely for several months.